It’s been more than seven months since I took delivery of my 1968 Zenit-3 camera, a beautiful, mechanical beast from the Soviet Union promising the retro joy of film photography and a new way of looking through the lens. I soon became used to its weight and vintage clunkiness, the lack of battery and digital function. A flurry of enthusiasm was dampened by my lack of experience, leading to the pain of ruining an entire film of shots. 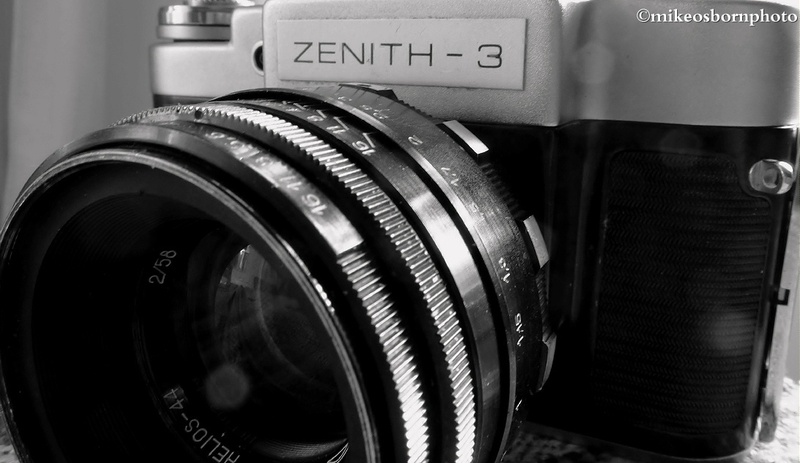 The heady smell of my Zenit’s leather case was left untouched for months before I dived in for another attempt. This time I minimised the risk of destroying another roll of film by winding it back prematurely. That was after fast-shooting in an afternoon to avoid further long delays. Well the first results were returned, and it evoked the boyhood memory of checking a sheet of negatives against the light. Yes, I had shots, although some had failed due to overexposure on a very bright day. This selection of monochrome images are simple, safe and taken around my west London neighbourhood of Hammersmith and Ravenscourt Park. Was it worth the wait? I love the grain to these shots. They feel entirely different to the crisp images produced by my Fuji X-E1. The focus and depth on the garden wall image is very good, while the floral images have a compelling quality in black and white. But the initial results of this return to film expose how digital has dulled my instincts for the technicalities of photography. I had to made blunt guesses about aperture and exposures – although analogue aficionado Stephen Dowling says a pocket light meter is a must. These photos, taken on a sunny day, seem a little bleached and lack the strength of contrast monochrome offers. However, the Zenit makes me think differently about taking pictures and often goes against my usual thinking. It obviously has practical drawbacks and requires the effort we used to exert without a moment’s worry. Right now the camera is sitting idly and may not be picked up again for a while. But after 45 years in existence, this patient creature is always ready for the next assignment with its latest – still wet behind the ears – owner. These are really subtle and yet achieve a wonderful crispness. Thank you Ella. I don’t think they have that razor sharp edge that good quality digital does – but they’re not supposed to! No I agree, I think it works really well. Thank you Ella, I appreciate your input. Thank you :-) The camera is a marvellous thing, but I don’t think I know how to handle him/her yet! A new game for you! You will like this! I always keep my grandad’s camera, a Kodak Retina II from 1948, and even my father’s a Praktica TLT3 with Carl Zeiss lens from DDR. The Praktica unfortunately does not functions well. It has an optical problem, but the Kodak is perfect! I always did this when I was much younger, even with a Zenit, but have forgotten the skills. 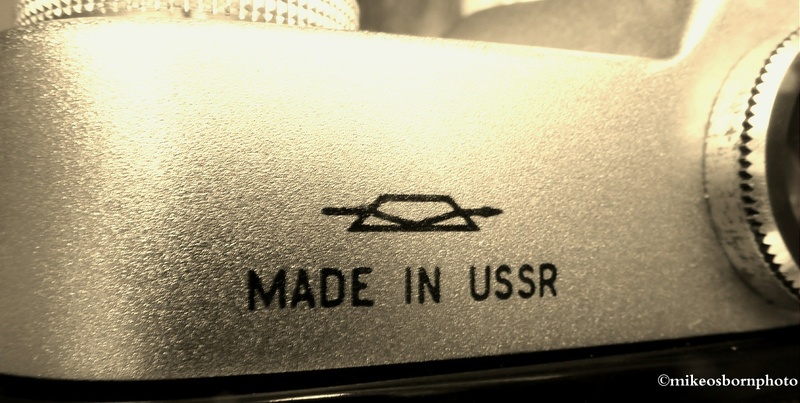 Your “elderly” cameras sound wonderful, Maria, even the GDR model which doesn’t work properly. These old cameras always look and handle so beautifully. Yes, they’re a little overexposed and this was hard to rectify in the edit. The old-fashioned impracticality will mean it’s just an occasional sideline for me, although I know others who live by film. Film definitely has a place, but from an SLR perspective, I came in at Digital, and it’ll always be the easier option for me. Well it certainly is. No cartridge loading and unloading (a stress in itself), easy to download and no processing charges… the list goes on, really. But I’ll persist as and when time permits. Mike, I am surprised this camera still works. Pictures are looking retro, and for people who remember this equipment and time that is fun and kind of nostalgia. Thank you for sharing. Thank you Alexander. Yes, it’s 45 years old and still functions. I think it’s a curiosity to produce vintage photos, but won’t be the mainstay of my photography. Would you like it or not but it is going to be kind of your mainstay because this beast (as you mention in your post) made you who you are as photographer. Anyway, your pictures from Canary Islands are great. I fear it’s destined to spend much of its time on the shelf. I’m glad you enjoyed the Fuerteventura photos – much appreciated. Thanks for picking this up, Stewart. Very cool. Reminded me that I wanted to do the same experiment with some old cameras I have laying around the house. It’s worth the effort, although it’s just an occasional sideline at the moment. The Zenit spends much of its time sitting there looking solid and beautiful! Hi Mike. I think I had one of these cameras when I was a boy! I doubt the low contrast has anything to do with your exposure – it usually a development ‘thing’. And it’s pretty hard to overexpose black and white film anyway. What film stock did you use? Thanks John, good of you to come by. I’m glad to hear that may well be the case – it’s out of my hands, then. I used Ilford 400, so pretty bog standard. My Dad gave me a new (early 1980s) Zenit when I was much younger, though I remember him saying ‘Can I have a look at your camera?’ quite a lot!! John, that’s great advice, many thanks indeed. I was guessing exposure based on the old Sunny 16 rule of thumb and have found an Android light meter app to fathom out. I’d certainly try a different film stock and delve into colour next time, although so much more can go wrong with it. You’re quite right, it’s an occasional indulgence and certainly creates interesting blog posts and responses. Many thanks again, much appreciated. No worries. Colour print film like Portra 400 has huge latitude. You can’t fail!! I’ll make a note of that. Not convinced of a grainy finish in colour and have seen Zenit shots much sharper elsewhere. That may tend to be with more up-to-date models (ie later than 1968 in my case). Thank you Noeline. Do you think it was worth all the effort? It’s worth dusting down your camera and having a try, but you may find it a little too absorbing – and not necessarily in a good way! Definitely! I particularly like the razor wire and park verge. I’ll definitely have a go one of these days but will wait until I have a little spare time to dedicate to it. I guess they all have a certain quality to them. I took a shot of the house I recently moved into, and it looks like it probably did one hundred years ago! Look forward to hearing about your Zenit adventure when you have the time. A few years ago, I picked up an inherited OM-1 and went shooting. I shot colour and B&W, but I felt my shots were bland, lacking contrast and I felt absolutely no connection to the camera or the shots. I was still very interested in shooting film, many of the people in my local Flickr group own and shoot film cameras, so I could see the potential. A friend offered to teach me to develop B&W film myself and after a few rolls, I had the process down pat. The added step of developing the film myself added that missing connection for me, but it also gave me that control that allowed me to affect the film how I chose, not just go for the middle ground. A few more home lessons and I was enlarging negs to make 8x10s and now every time I look at my OM-1, I want to go out and shoot and develop and enlarge. Developing is pretty damn easy and fairly cheap, perhaps you should try and it might just be what your shots need to go from safe, low contrast images to what you are looking for? Hi Ben. many thanks for your contribution – much appreciated. The suggestion of self developing is an intriguing one. I know some people who have gone down this route and found it very rewarding. The practicalities could be a hindrance, though… I sense that you have plenty of space where you are! I was just using the spare bathroom. The guy who taught me uses his laundry. You need space for enlarging, not much, but more than for developing, which only needs a bench and not even in a dark place. The most important thing you need is clean running water and some where to dump used chemicals. Other than that, it’s pretty simple. Thanks very much, Ben, sounds like space isn’t the issue. My Dad used to develop his own film back in the day and certainly didn’t have a lot of space. It’s shame that he’s no longer here to quiz about it… But shows the photography interest could well be genetic! Mike. Well worth the wait. Those gentle tones have a language of their own. Just looking at the pictures I can sense that stood still feeling the weight of the camera in your hand. Apologies for delay in replying. Living in the rural back waters of New Zealand means everything takes a little longer. Fond memories of Hammersmith and Ravenscourt Park. Good thoughts to you. Many thanks for your comments, Rufus. I’m glad you enjoyed the images and it evoked some west London. It’s enjoyable to take them, but the manual labour involved at either end is sometimes no fun. The digital process has its downsides too, so this is hard to weigh up. Solid piece of Kit and long live film. I can fully empathise with you on the fact that so often we can become lazy photographers with Digital and that with film/manual cameras we really enjoy the understanding of our equipment and what we can get from it. I am also in the stages of clean the lenses for my film camera and have reverted to shooting in manual mode with the digital camera to get the joy back into my photography. Whops sorry Mike going on too much. Thank you James, always good to have your input. I’d be interested to see how you find a reversion to film. 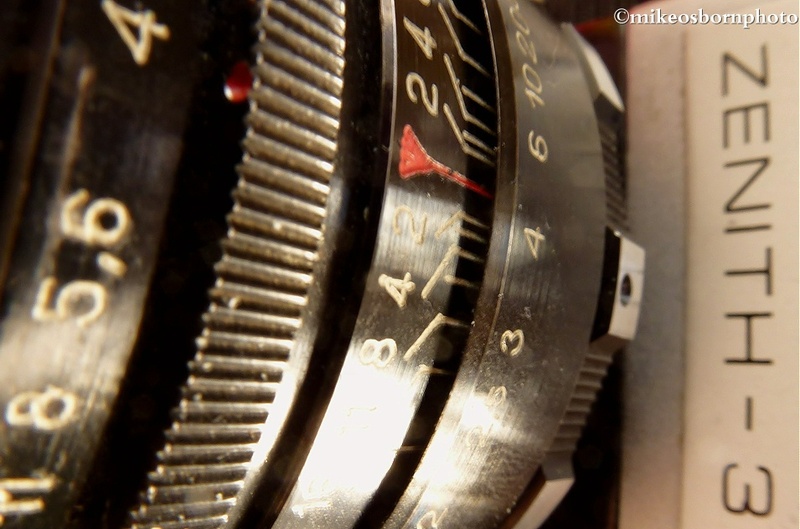 But manual mode in digital is a happy medium – I’m constantly twiddling with my dials and knobs! Will let you know as I get out and about. Lol! The grain was the first thing I noticed in these – I use a couple of photo editing programs which try to mimic this effect in digital images – seeing the ‘real thing’ was quite exciting! I love the look of the camera itself too. It has to be. There is something about film photography, its softness as well as its grittiness and the uncertainty of how the shot will look like until you get it back from developing, that is appealing. On the other hand the seemingly unlimited possibilities of digital photography are very attractive too. Have a good Sunday Mike!